Politico reported Monday that the U.S. Environmental Protection Agency has decided not to set enforceable health limits for PFOA and PFOS, two of the PFAS class of chemicals that are being increasingly strictly regulated by some states as more becomes known about their risks to public health. The EPA would not confirm that it has rejected calls by many campaigners and state officials to set a national standard for the two chemicals. The agency said in an initial statement that it will describe how it is “identifying and understanding” its approach to PFAS when it releases an action plan that is currently under review by other federal agencies. On Tuesday, the EPA issued a second statement saying that, contrary to some news reports, it has not finalized or publicly issued its PFAS management plan, a draft of which is being circulated to other agencies. It said it is committed to evaluating new drinking water standards under a process required by the Safe Drinking Water Act. Although EPA has reportedly rejected the idea of regulating the chemicals under the SDWA, it has decided to list them as hazardous under the Superfund law, which would force polluters to pay for cleaning them up, Politico reported. Lawmakers at federal and state levels said the Politico report appears to show that the EPA has dismissed calls for tough national regulation, and that states will now have to step up their own efforts to curb the chemicals. In Pennsylvania, high levels of PFAS contamination have been found, among other places, in public and private water systems in the towns of Horsham, Warminster and Warrington in Bucks and Montgomery Counties near two military bases where the chemicals were used in firefighting foam for decades. The chemicals were also used in consumer products like nonstick cookware and fire-retardant fabrics; they are no longer made in the U.S. but persist in the environment, and are widespread in humans, scientists say. Pennsylvania’s Democratic U.S. Senator, Bob Casey, said he was outraged that the Trump Administration appears to have abandoned the Safe Drinking Water Act, which he says should be used to set national health standards for the chemicals. Casey said he has already worked to push the Department of Defense to address the issue. Delaware Sen. Tom Carper said he’s disappointed but not surprised by the report. During confirmation hearings on Capitol Hill last week, Carper, who is the ranking Democrat on the Environment and Public Works Committee, had asked Acting EPA Administrator Andrew Wheeler if the EPA could commit to establishing a maximum contaminant level for PFAS within the next two years, and Wheeler answered no. Carper says unless Wheeler acts on PFAS, along with a number of other issues including climate change, he will try to block his nomination as permanent EPA Administrator. New Jersey has led the nation in moving to regulate PFAS, and the DEP says it will decide by this spring on regulations of PFOA and PFOS. A team of scientists that advises the DEP has recommended a limit of 14 parts per trillion (ppt) for PFOA and 13 ppt for PFOS. The state did set a limit for PFNA. Currently, the EPA has a recommended limit of 70 ppt for the two chemicals combined. Pennsylvania state Sen. Maria Collett, a newly elected Democrat who plans to introduce two bills to curb the chemicals, said she too was disappointed but not surprised to read the report that the Trump administration has backed away from regulating the chemicals. Advocates for strict national standards on PFAS chemicals in drinking water have long called for the EPA to set enforceable national standards. But in the absence of federal regulation, some states such as New Jersey have begun to impose their own levels which are much lower than those recommended, but not required, by the EPA. One campaigner said the EPA’s apparent decision puts even more pressure on states such as Pennsylvania to set their own rules. “There is no credible expectation that EPA is going to do anything at all now, and the only way to ensure clean drinking water is for the states to step up,” said Tracy Carluccio, deputy director of Delaware Riverkeeper Network, a longtime advocate for low health limits on PFAS. In Pennsylvania, Gov. Tom Wolf’s newly created Action Team on curbing PFAS has failed so far to propose regulation that would set specific limits for PFAS chemicals, Carluccio said. “They really have a responsibility they are not living up to at this point,” she said. Local governments, too, can protect residents from contaminated water, she said. 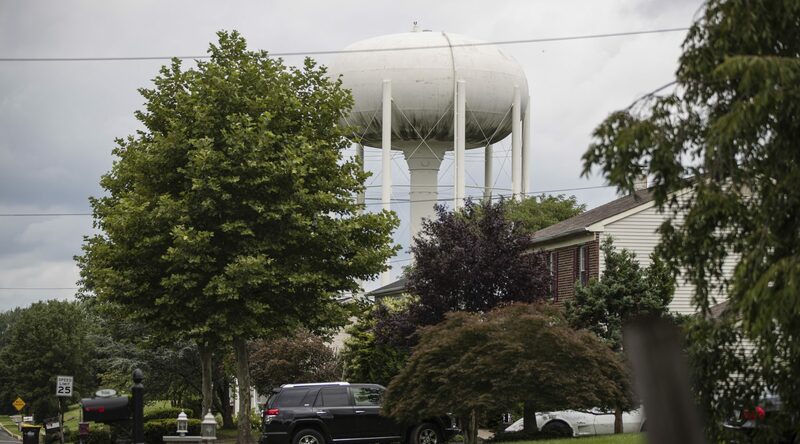 Horsham Township, for example, has installed granular activated carbon filters after finding high levels of PFAS contamination on its public wells, and has brought it down to very low levels. But Environmental Working Group, a national advocate for more action to curb the chemicals, said there shouldn’t be a patchwork of regulations that varies from state to state or even town to town. On Monday, Vermont announced a new health limit of 20 parts per trillion (ppt) for five PFAS chemicals in drinking water. That limit is less than a third of the 70 ppt limit that the EPA for two of the chemicals, PFOA and PFOS combined.